My husband absolutely loves camping. He enjoys everything about it – the choosing of the right park, the planning, the packing, the actual camping and then subsequent planning for the next outing. Although I’m not quite as avid a camper, I do admit that this passion has completely transferred to our daughters, and with good reason: They get an opportunity to enjoy and appreciate nature and take time out just to be kids. When planning for a camping trip, first things first: choose the park you want to visit. There are great websites such as ReserveAmerica.com or Recreation.gov to find helpful information. You can find photos of the parks and campsites, as well as details about the features, activities and amenities, such as whether water is nearby, if pets are allowed, if fishing, biking and swimming is accessible, and if hiking paths are within walking distance. Depending on the age of your children, you may want to consider parks with more conveniences, such as running water, toilets and easier, more accessible hikes. But find out ahead of time what your kids are interested in doing while camping. So far, we generally prefer leisurely activities and mostly stay around our campsite. We enjoy hiking, playing board games, swimming, cooking and just hanging out around the campfire. Keep in mind also that young children may be a little nervous on their first camping trip. It’s amazing how dark the outdoors can be without the usual city street lamps and building lighting. Glow sticks are handy to provide a little light in your tent during the night. You may want to do a trial run at home and set up camp in your backyard or inside. Your kids can get a feel for what it’s like to be in a tent and sleeping bag all night. Also, plan the meals together. Admittedly, one of my favorite activities while camping is eating by the campfire, and our kids enjoy the rustic feel of it. All-in-one-pot meals work best (think slow cooker meals, such as chili – we usually cook instant cornbread on top of the chili) so you’re not dealing with different side dishes and courses. You can do some of the preparation before you leave for your trip, such as chopping vegetables and meats and already adding spices and sauces. And, of course, don’t forget ingredients for s’mores. One of the most important planning measures for camping is making sure you have all the right gear. 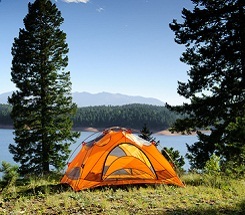 You need the standard equipment for the tent and for sleeping in the tent, as well as the cooking supplies, but also don’t forget things like folding chairs for the campfire, flashlights, a lantern or two, first aid kit, bug spray, sunscreen. Headlamps are also handy for walking around at night, so then you don’t have to deal with holding a flashlight. Be sure to also have the right clothing for your kids – it’s amazing how a warm day can turn into a chilly night. Plus, with all the outdoor activity, your child will likely get a bit dirty, so extra clothes are a necessity. Also, bring any fun activities (preferably nonelectonic ones) such as board games, playing cards and books. A great benefit to camping is the low cost. Even though the campsite reservation fees over the years has gone up, it’s a fraction of what it would cost to stay at a hotel. You’re also making your own meals, so not having to spend money eating out. Plus, all the entertainment you might do when you camp, such as hike, fish, ride bikes, swim, tell campfire stories and play games, are cost-free. One of the biggest benefits of camping is the wide-open spaces for kids to play, run and jump around. However, with that in mind, safety is of the utmost importance. Carefully supervise your children at the campsite and do not let them wander or hike alone. Also teach them about safety around campfires, raccoons, bears or other wild animals in the area, as well as how to spot and avoid poison oak or ivy. In addition to the fun activities and being outdoors, my daughters love how we spend uninterrupted family time together – no phones, schedules, TVs or computers to distract us. We can just simply enjoy each other’s company. My husband over the years has gotten me to camp more than I ever did as a child. I’m getting somewhat used to it, but admittedly still need some “creature comforts”. In fact, one of my campsite requirements is a coin-operated shower. So if you’re like me, bring that bag of quarters and you’ll be set.